• Improves blood production and capacity: the synergy of vitamins B6, B12, Fe, Cu and Co, necessary for optimal production of red blood cells. • Increases muscle performance, because of the supply of vitamins B2, B3, B5, Biotin, Inositol and Choline essential for the energy metabolism. Description: An injectable solution of the B complex vitamins, amino acids and minerals, specially formulated for the sports horse, to promote muscle metabolism, stimulate hemopoiesis, hold a strong lipotropic action helping to preserve the proper liver function. The effect of Vitamin B complex injection is fundamentally antitoxic, hepatoprotective, participating in the prevention and therapy of anemia and stimulates the level of energy metabolism. Composition: Each ml contains: Vitamin B2: 10 mg, Vitamin B6: 10 mg, Vitamin B12: 0,15 mg, Dexpanthenol: 15 mg, Choline 10 mg, Niacinamide: 100 mg Inositol: 10 mg, Biotin: 0,01 mg, Lysine 20 mg, Glycine: 20 mg, Methionine 20 mg, Cobalt: 7 mg, iron (ferric ammonium citrate) 15 mg, Copper 0,2 mg. 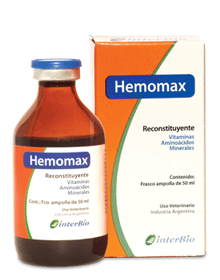 Indications: Hemomax is specially formulated to achieve and maintain optimal levels of hematocrit and hemoglobin in cases of anemia.Tonic in convalescence from different types of diseases, neuropathies in general. Promoter of appetite and growth. Prevention and treatment of weak and exhausted animals, as support for antibiotic therapy and different origin's stress of the sports horse. After intense exercise to replace the most important nutrients. During training, to speed up recovery time. Supplements all EV injectable solutions, such as amino acids, vitamins, electrolytes and dextrose. Therapeutic action: Energy, activating the metabolism, helps in the synthesis of red blood cells and the maintenance of normal blood profiles, hepatoprotective, detoxifying with vitamins, amino acids and minerals. 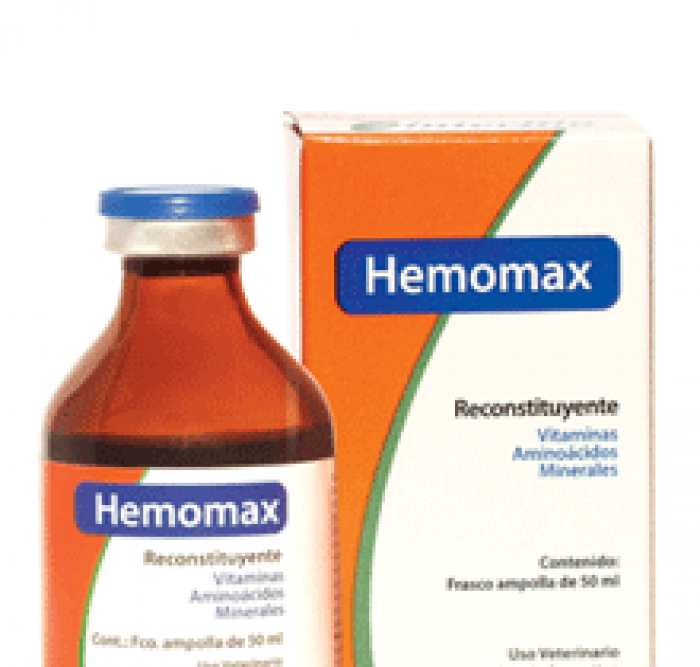 Dosage and Administration: Administer 1 ml/45 kg. b.w. every 48 h for a period of 7-10 days (4-5 applications) IV or IM. In preparation for the competition can be supplied 10 ml/day for 3 days prior to the test. Presentation: 50 ml bottle sterile multidose glass vial.